The Wednesday, May 18, 2016 Climate Justice Forum radio program hosted by Wild Idaho Rising Tide (WIRT) airs the second half of a keynote address, entitled The Human Element in Nature: From Harm to Hope, and audience conversations with climate movement leader, educator, and author Bill McKibben at Washington State University on April 13. Other discussions include a resurgence of wildfires around the tar sands extraction outpost, Fort McMurray, Alberta, and outcomes of Break Free Pacific Northwest actions in Spokane and Anacortes, Washington. Broadcast on progressive, volunteer, community station KRFP Radio Free Moscow every Wednesday between 1:30 and 3 pm PDT, live at 90.3 FM and online, the show covers continent-wide climate activism and community opposition to extreme energy projects, thanks to the generous, anonymous listener who adopted program host Helen Yost as her KRFP DJ. The Wednesday, May 11, 2016 Climate Justice Forum radio program hosted by Wild Idaho Rising Tide gratefully shares May 9 on-air conversations with Ahmed Gaya, an organizer of the thousands-strong Break Free Pacific Northwest direct actions against two March Point oil refineries near Anacortes, Washington, on May 13 to 15, and with Abby Brockway and Patrick Mazza, two of the Delta 5 oil train blockaders in an Everett, Washington rail yard in September 2014, both with Praxis radio show producer Taylor Weech on KYRS Spokane. Ahmed, Abby, and Patrick discuss their backgrounds and reasons for climate activism and the impacts and precedents that their civil disobedience and court cases impart to fossil fuel resisters in the climate change movement. Broadcast on progressive, volunteer, community station KRFP Radio Free Moscow every Wednesday between 1:30 and 3 pm PDT, live at 90.3 FM and online, the show also covers the Fort McMurray and Alberta tar sands wildfires, the U.S. Army Corps of Engineers denial of a Gateway Pacific coal export terminal permit threatening Lummi Nation treaty-protected fishing rights at Cherry Point, Washington, and continent-wide climate activism and community opposition to extreme energy projects, thanks to the generous, anonymous listener who adopted program host Helen Yost as her KRFP DJ. Are You Participating in Break Free in Anacortes & Spokane? 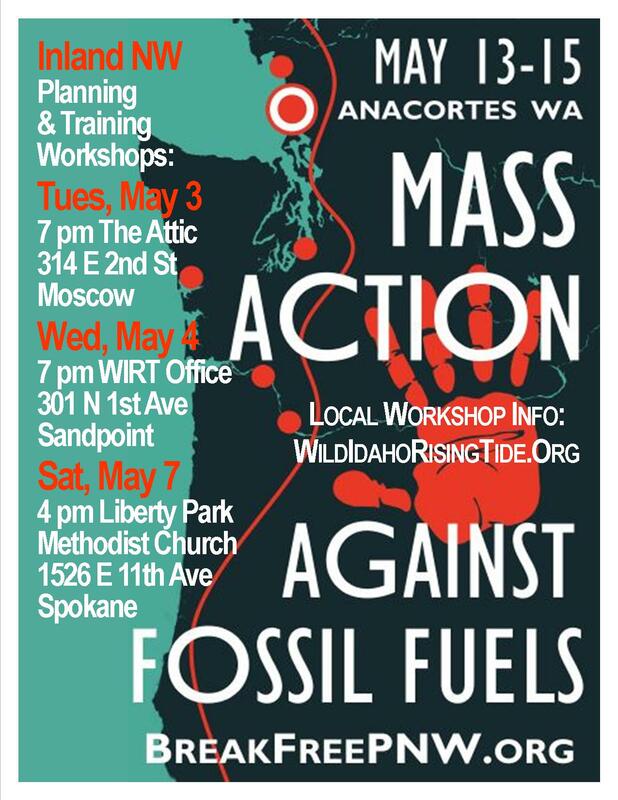 Over the last few months, Wild Idaho Rising Tide (WIRT) activists and allies have been working diligently at online education through various channels and on interpersonal outreach at dozens of regional events*, to mobilize hundreds of inland Northwest residents to participate in the Break Free from Fossil Fuels mass action in Anacortes, Washington, on May 13 to 15. 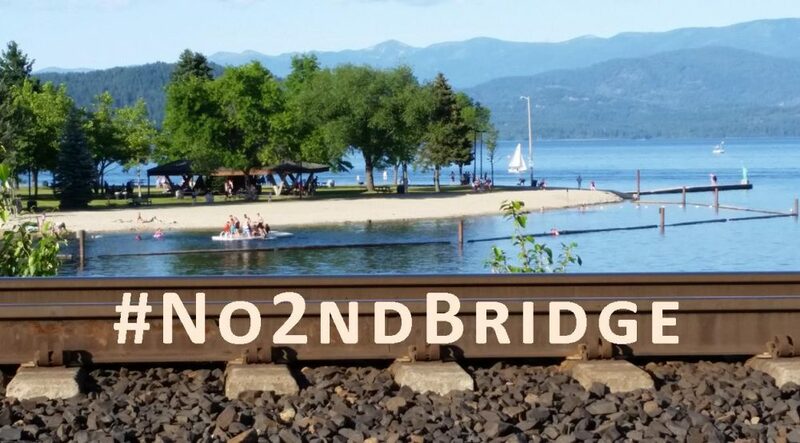 After contributing copious amounts of time, energy, and funds to reach out to you and request your participation, and to contact about 60 people from Idaho and eastern Washington signed up through the Break Free Pacific Northwest website, we hope to hear from you: Are you training and traveling to Anacortes? We welcome your friends and families at these gatherings providing workshop materials, snacks, and beverages. Please forward this event announcement to your comrades and invite them to support this historic protest by attending this well-anticipated workshop and the thousands-strong Break Free action in mid-May. For further information and to discuss these opportunities, please call, text, email, or facebook message WIRT through the enclosed contact channels. Through the ongoing participation of Northwest fossil fuels resisters in public events, hearings, marches, and media stories, we have clearly registered our opposition to the expansion of coal, oil, and gas infrastructure projects across the region. Accelerating impacts of climate change call for ever stronger messages and unified, non-violent, civilly disobedient, direct actions. For months, Pacific Northwest organizers have been planning a Break Free from Fossil Fuels action, a mass 350.org and allied protest of two crude oil refineries at March Point near Anacortes, Washington, on May 13 to 15, 2016 (http://breakfreepnw.org/). Please join us in risking arrest or supporting others as part of ongoing Northwest resistance to fossil fuels. In late March 2016, Wild Idaho Rising Tide (WIRT) and allies promised hundreds of participants in well-attended screenings and panel discussions of the global climate activism documentary This Changes Everything in Moscow and Sandpoint, Idaho, and at WIRT’s Fifth Annual Celebration in Moscow, that we intend to stage regional direct action and kayaktivist trainings before the Anacortes uprising. Over the last month, we have incessantly requested that our western Oregon and Washington colleagues send trainers to the inland Northwest, to further recruit, mobilize, and prepare activists for the mid-May Break Free Pacific Northwest action. After pouring years of energy into supporting opposition to Washington state fossil fuel infrastructure projects, we are understandably eager for some West Coast input toward receptive inland Northwest frontlines. A small team of Oregon comrades generously proposed to travel to northern Idaho and eastern Washington and present several trainings on consecutive days, among a dozen similar workshops scheduled across the region. But considering the time and expense involved in providing guidance to predictably low Idaho turnouts, they decided to cancel their plans.